It’s hot, you’ve just finished working out or chasing the kids around the yard. Sweat is pouring from your brow and you’re starting to feel a little woozy. You need to get hydrated – STAT! You need to drink water, but even better than just water is water with electrolytes. Electrolytes, such as sodium and potassium, help to get you re-hydrated and keep your blood pH balanced. Many sports drinks have electrolytes in them, but they aren’t always convenient. You have to buy them in advance, they aren’t always cheap, and they can have over 100 calories per bottle. Enter Crystal Light Pure Fitness, the latest addition to the Crystal Light product line. The concept is simple. Keep the small packages of Crystal Light Pure Fitness in your purse, in your car, in your pocket, or wherever you are. If you’re in need for some hydration, just add a packet to a bottle (16.9 fl oz) of water, shake to mix, and voila! You have a grape, strawberry kiwi, or lemon lime flavored fitness drink. Crystal Light Pure Fitness does not contain artificial sweeteners, flavors, or preservatives and has just 15 calories and 3 grams of sugar per serving. It is also caffeine free, and gluten free. 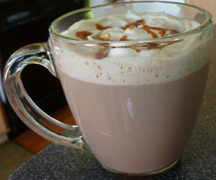 The sweetness of the beverage comes from Truvia, which is derived from the stevia plant, and is an all-natural, zero-calorie sweetener. Crystal Light Pure Fitness also has the previously mentioned sodium and potassium electrolytes to help you get hydrated during light activity. 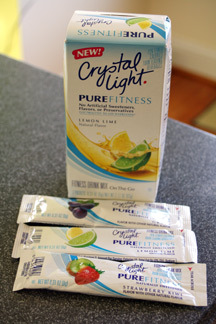 We had an opportunity to try all three flavors of Crystal Light Pure Fitness. 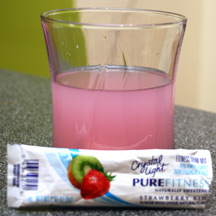 Crystal Light Pure Fitness Strawberry Kiwi has a light, subtle flavor. The kiwi flavor was the predominant flavor for me, but even the I noticed it the most with the after taste. 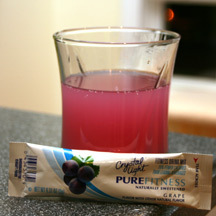 Crystal Light Pure Fitness Grape smelled just like a grape drink. Don’t laugh…there are some “grape” drinks out there that don’t even come close to smelling like grape. This one wasn’t super sweet, but it was definitely a good grape flavor with a slight tartness to it. The most surprising thing for me was that the drink wasn’t grape purple colored. Crystal Light Pure Fitness is colored only with natural ingredients, so maybe there’s a narrow color spectrum that they can create. I don’t know…in the end the color didn’t bother me because the flavor of the drink was still good. I thought the Crystal Light Pure Fitness Lemon Lime tasted like Sprite without the carbonation. For me, the lemon flavor was the stronger of the two, with just a hint of the lime. I drank this after running ladders one hot Saturday afternoon and though it was the perfect refreshing drink. Just add it to a bottle of ice water and Mmm – awesome. Crystal Light Pure Fitness is available in stores nationwide. It costs around $3.29 for a box of seven packets. For more information about Crystal Light Pure Fitness and Crystal Light, you can Like Crystal Light on Facebook or follow them on Twitter. Disclaimer: This post consists of my (and/or fellow tester) opinions only. No compensation was given for this review/giveaway. 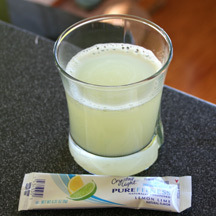 I did receive free Crystal Light products from the manufacturer or representing PR agency for the purposes of testing. This did not affect the outcome of this review.